If you’re looking for a new pastime and radio and communication pique your interest, ham radio (also known as amateur radio) is an excellent hobby to get into. Not only does it provide hours of enjoyment and allow you to communicate with people around the world, but it’s also a great way to protect yourself in emergency situations. When you don’t have access to the Internet or phone lines or if these systems go down, these devices serve are invaluable tools that can provide invaluable information. There are a few types of amateur radio devices, including handheld ham radios, fixed units, and mobile ham radios. Handheld units, as the name suggests, are portable, meaning that you can take them with you wherever you go. Fixed models are permanently installed in a location, such as your home. Mobile amateur radios are designed for use in vehicles; hence the name “mobile”. If you’re profession involves driving or you just spend a lot of time in your vehicle, a mobile ham radio is a great option to consider, as they have a more compact profile than fixed devices and they tend to be more powerful than portable units. To decide which one will best meet your needs, read through the reviews below. When you’re ready to make a purchase, click on the yellow links to find the best prices currently available on Amazon. 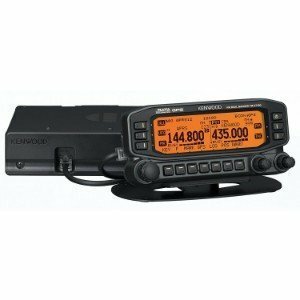 First up on our list of the best mobile ham radios is an option that comes from Kenwood. This manufacturer offers a large selection of navigation and communication tools, including radar detectors, standard walkie talkies, long range walkie talkies, CB radios, marine GPS and handheld GPS devices, and weather radios; just to name a few. 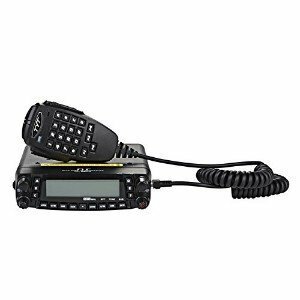 They also produce several mobile amateur radios, and their TM-D710G 144/440MHz Amateur Mobile Transceiver is their top-of-the-line model. As a dual-band radio, you can use this transceiver for VHF+VFT, UHF+UHF, and VHF+UHF operation, which makes this device highly versatile. It boasts 1,000 multifunctional memory channels, including five-in-one programmable memory, and it offers 118-534MH and 800-1300MHz reception, so you’ll have no trouble accessing channels and communicating with other ham operators on this device. With a built-in global positioning system, this unit can also be used as a car GPS so you’ll be able to find the best path to travel. Other notable features of this device include digital code squelch, an easy to ready LCD screen (which can be illuminated in two colors: amber or green), EchoLink Memory, and EchoLink Sysop Mode. Lastly, this transceiver has a low-profile design, so you’ll have no trouble fitting it in your vehicle. According to the reviews that we’ve read, the majority of customers who have used this device are very pleased with it; they said that it’s easy to install and use and offers clear reception. Final Verdict: Overall, we are quite impressed with the Kenwood TM-D710G 144/440 MHz Amateur Mobile Transceiver. It’s full of useful features, has a low-profile design, is easy to use, and offers wide – and clear – reception. 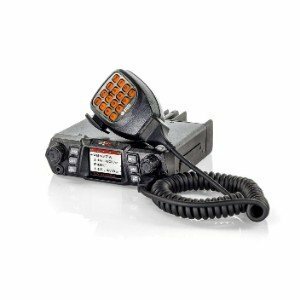 If you’re looking for a more affordable dual-band mobile hand radio that is easy to use and offers plenty of features and power, then the Yaesu FT-8900R Quad Band Hi Power FM Amateur Ham Radio Transceiver is a great option. Since it’s so easy to use, it’s a great choice for novice ham operators, yet it boasts plenty of features to satisfy more experience users. This device transmits 50 watts on 10, 6, and 2M and 35 watts on 440MHz, so it offers great power; plus, you can select lower settings, if you choose. Transmission and reception is great, too; as it receives from 28-29.7 up to 700-985MHZ and transmits 28-29.70 up to 430-450MHz. The backlit keypad and LCD alphanumeric display are easy to see in all types of lighting. Other key features include 800 memory channels, live dual displays, a cross band repeater mode, and it comes with a YSK-8900 separation kit. Most reviewers said that they were impressed with the easy installation of this device, as well as the convenient programming and operation; plus, they like that it’s affordably priced. Final Verdict: If you don’t want to spend a lot on a mobile ham transceiver, but you don’t want to sacrifice capability, the Yaesu FT-8900R Quad Band Hi Power FM Amateur Ham Radio Transceiver is a great choice. Compared to other mobile units, this one is well priced, it offers great reception, and it’s easy to use. Even more affordable than the previously mentioned mobile ham transceiver is the ICOM IC-2730A Dual Band VHF/UHF 50 W Mobile Radio. This device offers great power, it has a compact profile, and it boasts all of the necessary features to keep in you connected when you’re on the road. This device offers three output power options, including 5 watt, 15 watt, and 50 watt. RX frequencies include 118-174MHz and 275-550MHz, so you’ll have no trouble connecting. It also boasts 1052 memory channels, which includes 50 scan edges and 2 call channels. As a dual band unit, you’ll be able to receive VHF/VHF, UHF/UHF, and VHF/UHF. The large, brightly lit screen clearly displays channels and frequencies, so you’ll have no trouble seeing in any type of setting. Most customers who have used this unit said that they are very pleased with the power and capabilities. They also noted that it’s easy to program and that it offers great quality. Final Verdict: The ICOM IC-2730A Dual Band VHF/UHF 50W Mobile Radio offers everything you need for ham radio communication in your vehicle. It has plenty of power, offers great connectivity, and is easy to install and operate. Next on our list of the best mobile ham radios is the TYT TH-9800 Band 50W Cross-Band Mobile Car Ham Radio. It’s even more affordable that the two above-mentioned units and it offers plenty of great features; however, do note that it doesn’t offer quite as many functions as the higher priced models. 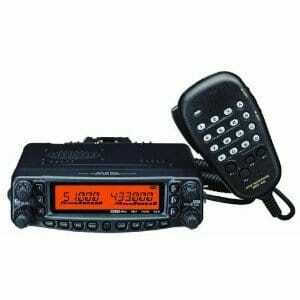 This unit is a 50 watt/ 40 watt full quad band FM mobile ham radio that features full twin display and receive. It also boats a cross band repeater mode. It can transmit 10M (at 29MHz), 6M (at 52MHz), 2M (at 146MHz), and 70cm (at 440Mhz). It can also receive 26-33MHz, 47-54MHz, 110-180MHZ, 350-399MHZ, 430-512MHz, and 750-947MHz. This device only offers 809 channels and 256 memories, though, which is lower than the three previously mentioned models. Other notable features include a backlit keypad with a keypad lock function, channel name editing, multi-function scanning, and it comes with a DTMF mic. Most users said that they are impressed with the device, especially considering the price. They said that it’s easy to install, program, and use, and that it offers pretty powerful transmission and reception; however, some customers did note that the display could be better and that the sound wasn’t as clear as they hoped. Final Verdict: If you’re just getting into ham radio communication or you don’t want to spend a lot on your device, the TYT TH-9800 Quad Band 50W Cross-Band Mobile Car Ham Radio is a good choice. It’s affordably priced and offers all of the basic features that you could need for on-the-road amateur radio communication. To complete our list of the best mobile ham radios is the BTECH Mobile UV-50X2 50 Watt Dual Band Base, Mobile Radio. This is the most budget-friendly model featured on this list; however, it is also the most basic, as it doesn’t offer as many features as the other four units that we have featured. Nevertheless, it’s a great way to communicate when you’re on the road. This unit features a dual synchronize display mode, as well as mic audio grain settings, and provides an expanded frequency range of up to 520MHz. You can adjust the power settings to high (50 watts) or low (10 watts). The frequency range on this device is 65-108 MHz, which only gets commercial FM radio reception; on VHF, the frequency range is 137-174MHz (Rx/TX), and on UHF, the range is 400-520 MHz (Rx/Tx); plus, you can select broadband or narrowband. The LCD display screen is easy to see and the colors can be customized to your particular preference; there are 9 different colors available and 10 different display elements. You also have the option to edit the channels to your specific preference without having to worry about programming a new channel. The tones can be edited, you can add squelch info; or you can add it in or take it out from your scanning list whenever you want to. The device can be set so that it begins scanning when it reboots, or to start scanning when the device turns on. Lastly, thanks to the in-menu audio adjustments, you can change the microphone gain. Based on the reviews that we read, most users are happy with this device. They said that it was easy to install and use and that they enjoyed the features that it offered; however, they did note that it wasn’t as powerful as they thought it would be. It’s important to note, though, that it is a low-budget mobile ham unit, so don’t assume that it is going to be as powerful as higher priced devices. Final Verdict: For the price, the BTECH Mobile UV-50X2 50 Watt Dual Band Base, Mobile Radio is definitely worth considering. It offers all of the necessary features, it’s easy to install, and it will certainly keep you connected when you’re on the road. If you’d like to stay connected when you’re on the road, then a mobile ham radio is definitely worth the investment. These devices are more powerful and offer more functionality than a CB radio, and they’re a great way to communicate with other drivers, as well as other ham operators, wherever they may be. Plus, using an amateur radio is just plain fun! If you’re thinking about purchasing a mobile ham radio, then you’re going to want to invest in the best unit for your needs. How can you do that? By taking the following factors into consideration. What type of communication you want to engage in. If you’re only planning on using it for emergency communication in short ranges, then a VHF/UHF radio that offers up to 5 watts should work fin; however, if you want to connect with other ham operators that at great distances, then you’ll want to invest in a radio that offers both UHF an VHF coverage and provides a minimum of 25 watts of power. By taking these factors into consideration, you will be able to find the best mobile ham unit to suit your on-the-road communication needs.